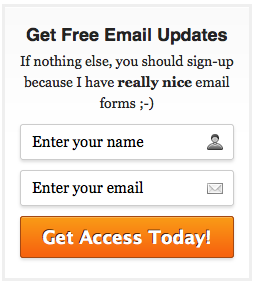 Every time I talk about the importance of building an email list, and the effectiveness of email signup forms in the right places, people always ask for the code to create awesome optin forms. And today, those wishes are answered :-D.
You see, when you want a custom AWeber email signup form, they can cost anywhere from $50 to $150 a piece. How do I know? Because I’ve hired designers to create them for my site and that’s what I’ve paid for them. However, since you’re all loyal readers of the DIYthemes blog, we tasked our designer Alex Mangini to whip you together 7 custom AWeber email signup forms at no charge to you (that’s around a $700 value). These forms are for AWeber only, but don’t worry. 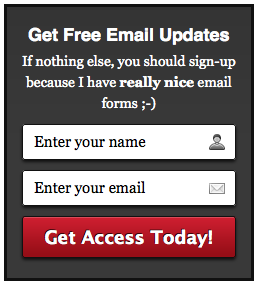 In the future, we’ll make these forms compatible with other providers too. Then, when you’re done, inside, you’ll see 7 different folders. 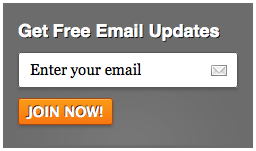 In each folder, you’ll see the directions on how to install each email signup form. Make sure you follow those directions for installation. And naturally, just place the HTML form there, and you’re set. What Do These AWeber Optin Forms Look Like? There’s 7 of them. Here are them in order. Do you like these forms? If so, then please share it on Facebook, Twitter, or wherever it is that you share things. If you like them, I’m sure your friends will too :-).